Aerial Rescue TrainingAt Green Leaf Tree Services, we take safety very seriously. 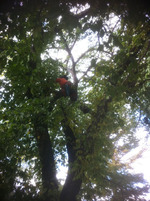 An arborist performs high angle rope work, often with a chainsaw. Because of this, there is a great need to train to industry best practices. Green Leaf Tree Services is SAFE company certified, and we have an extensive safety program which our staff adheres to in order to ensure we maintain a high level of safety while caring for your trees. In this picture, crew members practice the skills needed to safely and efficiently access an injured coworker, assess their injuries, and bring them safely to the ground. Our company has been assessed through random audits by WCB compliance officers and we have always met and exceeded their expectations. Proper tree pruning has many benefits to enhance trees in our landscapes. Green Leaf was commissioned to assess and provide pruning services on a beautiful American Elm tree on lake Windermere. 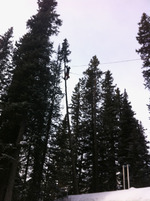 Our skilled climbers removed dead wood and crossed and rubbing branches. We also raised the canopy above the cabin by making proper cuts to ensure the continued health of the tree. It was a pleasure to work on this tree!